We are thankful for the dedicated and compassionate staff and outstanding clients who have contributed to our success as a nationally-recognized agency elder care agency. Here are some of our recent in-home care awards and accolades. Generation Solutions was named the 2018 Small Business of the Year. We are proud to be recognized by our local community and take pride in serving our clients to keep them happier and healthier at home. 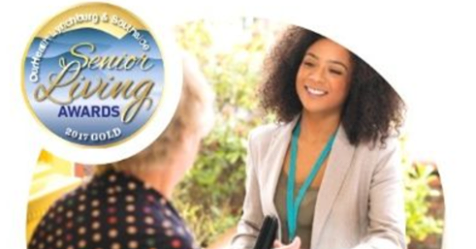 The Generation Solutions team is honored to be awarded FIRST place in both the Home Health & Companion Care categories in the latest edition of Our Health Magazine’s Senior Living Awards. Being voted #1 means a tremendous amount to the clinicians, caregivers, and support staff that strive every day to keep our community’s seniors happier and healthier at home. Thank you to all of our clients, patients, & health care community partners that chose to recognize our team. Generation Solutions is proud to announce that we are listed in the top 25 percent of home health agencies in the country by HomeCare Elite®! HomeCare Elite honors the top-performing agencies as measured by five categories: quality of care (outcomes), best practice implementation (process measures), quality improvement and consistency, patient experience (HHCAHPS), and financial health. 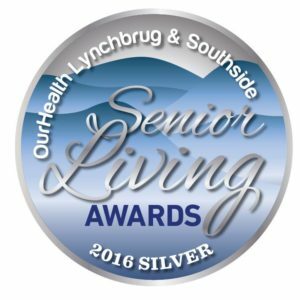 Generation Solutions was awarded Best Home Health Provider for the months of August and September by Lynchburg Living “Best Of” Contest. Lynchburg Living is Central Virginia’s premier resource for healthcare and healthy living lifestyles information for its residents, physicians, non-physician providers, clinical professionals, healthcare leaders and executives. 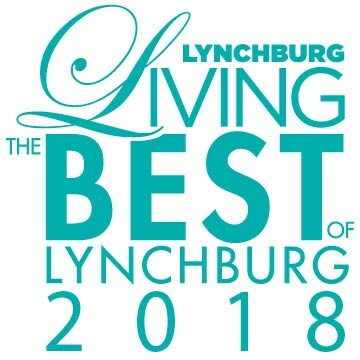 Over 50 service categories are represented in Lynchburg Living “Best Of” Contest, including Best Family Practice, Best Real Estate Company, Best Law Firm, and more. Generation Solutions is recognized nationally by Centers for Medicare and Medicaid (CMS) as being in the top 25% of home health agencies for quality care and patient outcomes. Most home health agencies in the US have 3 or 3.5 star rating. Only 24% of agencies have a Medicare rating above 3.5 stars, and Generation Solutions is one of those agencies with a 4-star rating. Generation Solutions exceeded both the national and state Medicare average rating of 3.5 stars. Generation Solutions is honored to be recognized by the Virginia Association for Home Care and Hospice (VAHC) for our Contractor Alliance Program and receive the prestigious Innovation of the Year Award for 2017! 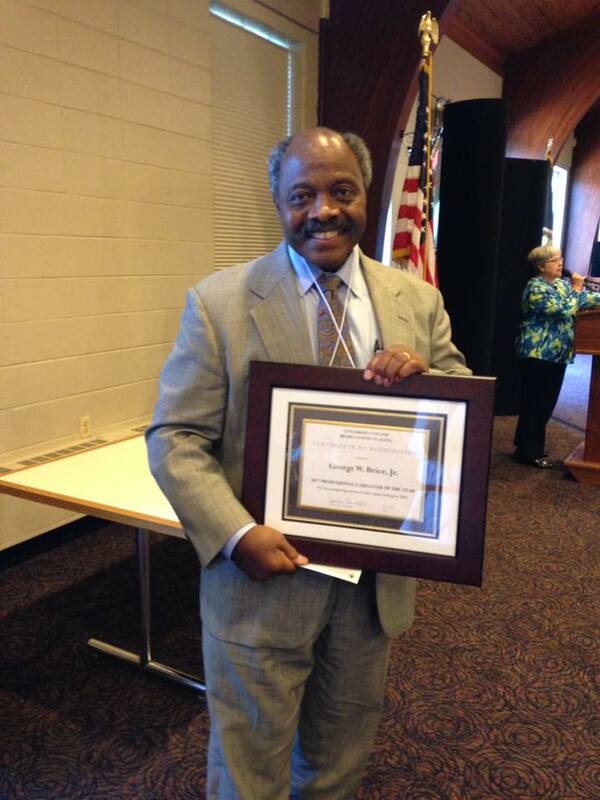 We are proud to have Mr. George Brice recipient of the Caregiver of the Year Award 2017 Lynchburg College Beard Center on Aging on our team!! Congratulations Mr. Brice you perform amazing work for our local seniors. The Generation Solutions team is honored to be awarded FIRST place in both the Home Health & Companion Care categories in the latest edition of Our Health Magazine. Being voted #1 means a tremendous amount to the clinicians, caregivers, and support staff that strive everyday to keep our community’s seniors happier and healthier at home. Thank you to all our clients, patients, & health care community partners that chose to recognize our team. 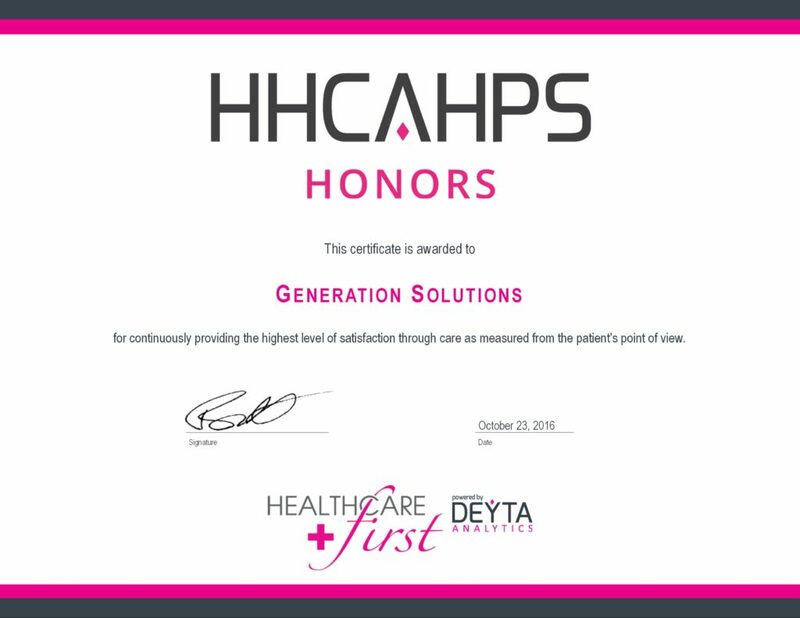 Generation Solutions Skilled Home Health has been named a 2016 HHCAHPS Honors recipient by HEALTHCAREfirst. HHCAHPS Honors is a prestigious award recognizing home health agencies that continuously provide quality care as measured from the patient’s point of view. It acknowledges the highest performing agencies by analyzing the performance of Home Health Consumer Assessment of Healthcare Providers and Systems (HHCAHPS) satisfaction measures. What a great team of professionals that our patients and community can be proud of! 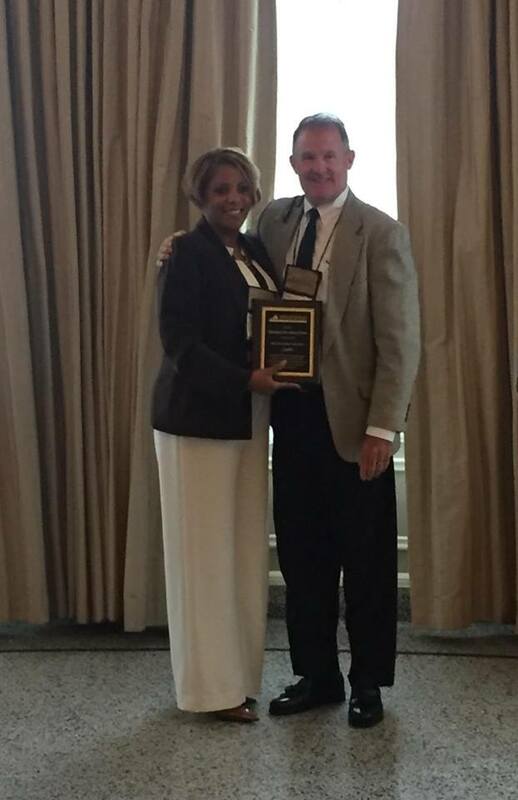 Generation Solutions is thrilled to be recognized by our community as the #1 home health care provider. We strive every day to provide exceptional service and quality care. We always keep our mission to allow seniors to stay happier & healthier at home in mind. 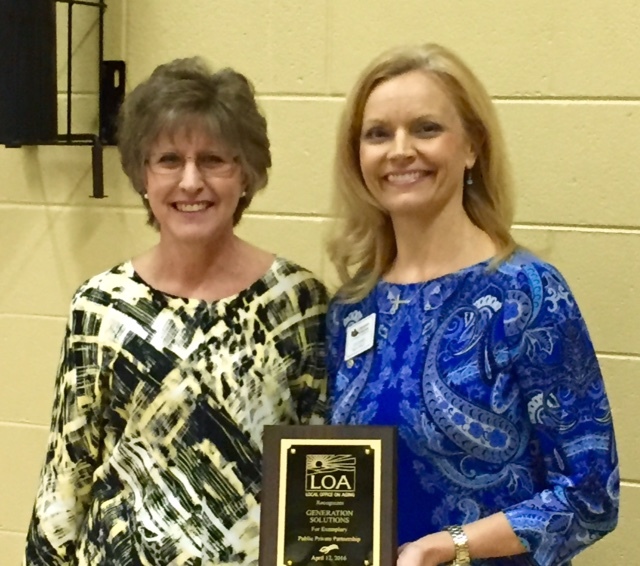 Generation Solutions is extremely proud to accept the LOA’s (Roanoke’s Local Office on Aging) Public-Private Partnership award. Generation Solutions is proud to provide personal care & companion services to seniors involved with the LOA in the Roanoke valley! Our organization salutes Paula Leascar RN, our scheduling staff, and many many caregivers for their hard work and quality service. 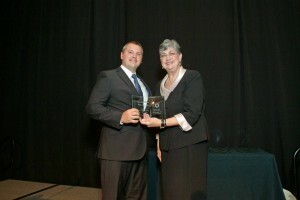 PHOTO: Lois Larson receiving the LOA award on behalf of Generation Solutions. 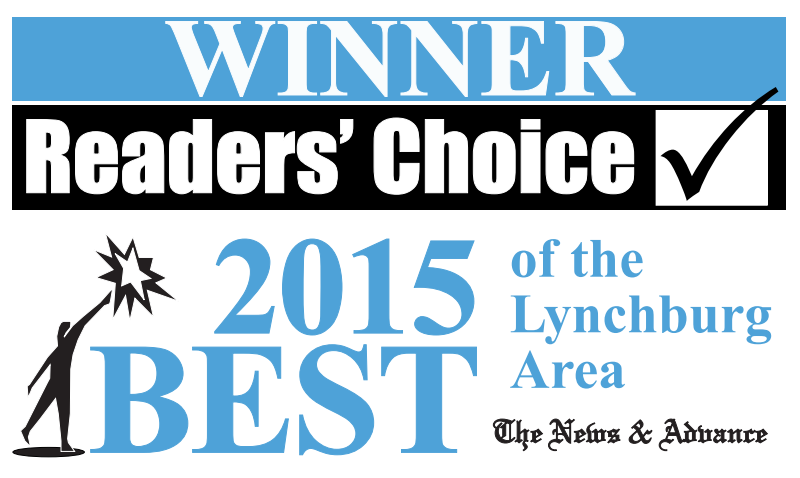 Generations Solutions was voted the #1 Home Health Care Agency by the readers of the Lynchburg News & Advance in the 2015 Readers Choice Best of the Lynchburg Area Awards in July, 2015. [News Release] – The U.S. Small Business Administration’s Richmond District Office proudly announces P. Tulane Patterson, the CEO and Owner of Generation Solutions Holdings Inc. located in Lynchburg and Roanoke, as Virginia’s 2015 Small Business Person of the Year. Although this isn’t Kansas, Generation Solutions’ motto “No place like home… For senior care” says a great deal about their mission. They understand older adults prefer to spend their retirement years living in the comfort of their own homes. The company provides an integrated program of home care services intended to enable older adults to live comfortably, securely and independently in their homes as long as possible. Their home health aides provide personal care such as bathing, feeding, ambulating and caring for bed-bound individuals. The Roanoke Division of Generation Solutions was named the 2014 Small Business of the Year for Business to Consumer services. We are proud to be recognized by our local community and take pride in serving our clients to keep them happier and healthier at home. Generation Solutions has once again been selected as top 500 (top 5%) of the 2013 HomeCare Elite. The HomeCare Elite honors the top-performing agencies in five categories: quality of care (outcomes), implementation of process measures, quality Improvement, patient experience (HHCAHPS), and financial performance measures. The 2013 HomeCare Elite was compiled using publicly available data from the CMS Home Health Compare and CMS cost reports. 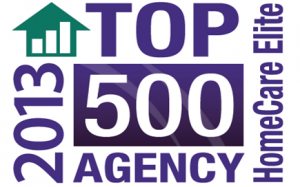 Plus, each year, the top 100 and top 500 agencies overall are given special recognition. 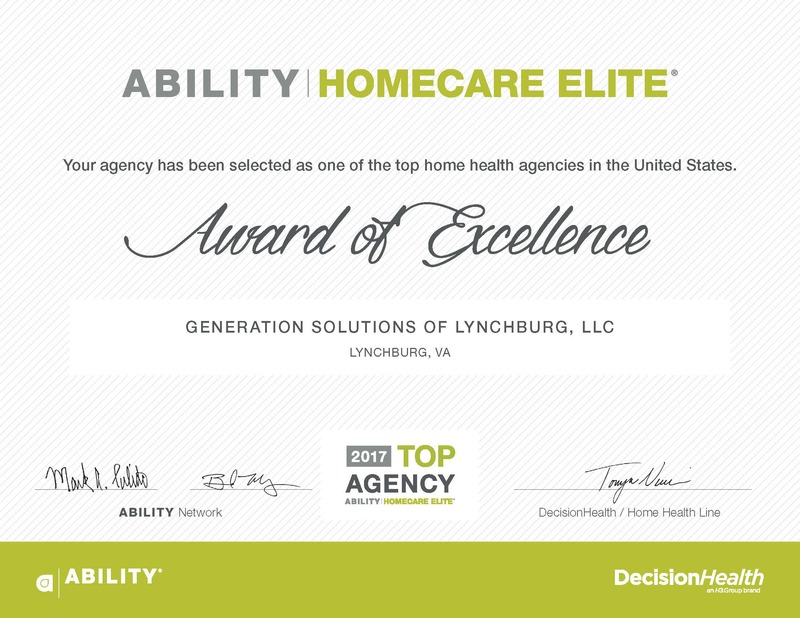 Generation Solutions is proud to be named a Top Agency in the OCS HomeCare Elite. The HomeCare Elite is the only performance recognition of its kind in the home health industry. 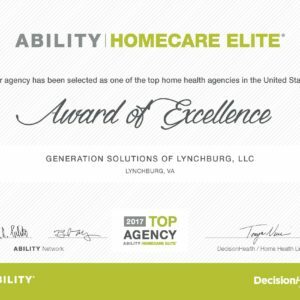 Generation Solutions is the only home health agency in Lynchburg to have ever been named among the top 1% of home health agencies in the nation. The OCS HomeCare Elite lists those home health agencies whose outcomes of care put them among the top agencies in the nation. Generation Solutions is proud to have received this award for seven of the last eight years. 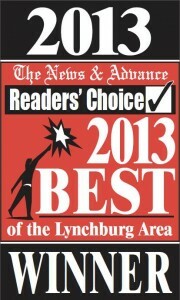 Generations Solutions was voted the #1 Home Health Care Agency by the readers of the Lynchburg News & Advance in the 2013 Readers Choice Best of the Lynchburg Area Awards on July 28, 2013. 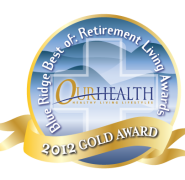 In Our Health Magazine’s 2012 Retirement Living Awards, Generation Solutions is proud to have been awarded “GOLD” – the highest rating in two separate categories: Home health Care, and Companion Care. The 2012 Tayloe Murphy Resilience Awards offer small businesses nationwide an in-depth look at how resilient companies in the areas of Virginia that have been hardest hit by the economic downturn, which began in 2008, are leading economic recovery in their communities. The Tayloe Murphy Resilience Awards honor and support Virginia entrepreneurial businesses that demonstrate sustained vitality and commitment in areas characterized by high unemployment, high poverty and low entrepreneurial activity. Generation Solutions is proud to be recognized as a Semi-finalist for this award and continues to work hard to adapt during this slow economic time. Generation Solutions is pleased to be recognized with the 2012 Best Practices Award by The Commonwealth Council on Aging for its creative & effective approach to serving Older Virginians. Generation Solutions made a clean sweep of the Retirement Living Awards receiving 3 Gold and 1 Bronze award in four categories. Generation Solutions Medical Supply Store received 2 Gold Awards in the categories of Medical Equipment & Medical Supplies. Generation Solutions received a Gold Award in the category of Companion Care and a Bronze Award in the category of Home Health. 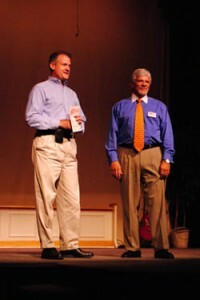 The Roanoke Division of Generation Solutions received a nomination for Roanoke Regional Chamber of Commerce Small Business Award for 2011. 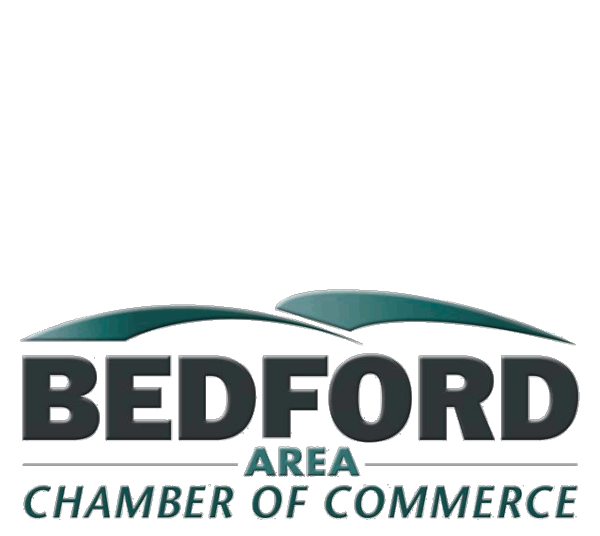 We are proud to be recognized by our local community. Generation Solutions was once again named into the Home Care Elite, a compilation of the top performing home health agencies in the United States. Generation Solutions’ president Gene Erb said, “We thank our employees who continually provide quality care to our patients and clients.” Generation Solutions is the only locally owned home health agency in the Central Virginia area that provides private duty services, skilled nursing/therapies, medical equipment and supplies. Many of my friends have been able to remain in their homes with the help of staff from Generation Solutions. I have personally witnessed their skilled work in my friends’ homes. If the time comes that I need help to remain in my home, I would quickly call Generation Solutions.